People are increasingly using apps for work on their personal mobile devices. This is especially true of “deskless” workers—employees who spend most of their work day away from a desk—in industries like retail, manufacturing, healthcare, airlines and consulting. In the case of Yammer’s customers, an employee might use the Yammer mobile app to help customers in-store or share customer feedback with colleagues. In other scenarios, employees might access Yammer when they are in transit or working remotely. This trend of using personal mobile devices for work presents a challenge for IT departments that want to ensure the security of company data, especially those concerned about unintentional data leaks. 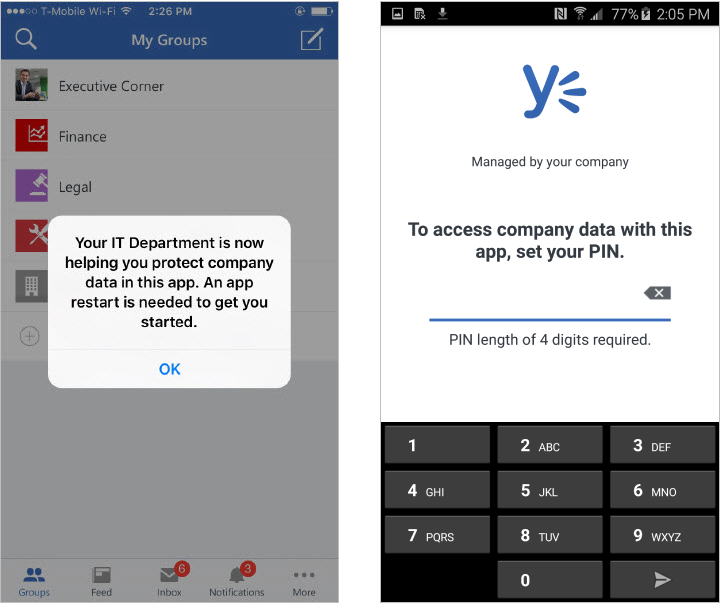 Today, we’re excited to announce an update to the Yammer apps for iOS and Android that allows IT administrators to protect their corporate data using mobile application management (MAM) controls in Microsoft Intune. 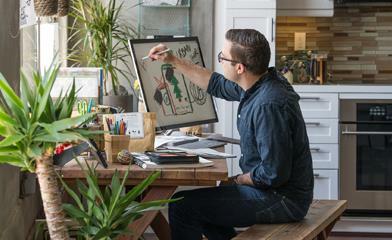 Using Intune, organizations can provide their employees with access to corporate apps, data and resources on their personal mobile devices while protecting their corporate data with a rich set of mobile device management, mobile application management and PC management capabilities delivered from the cloud. Read the Intune blog post for more details. Administrators can now apply different policies for the Yammer apps. These policies include requiring a PIN or corporate credentials to access the apps, limiting data sharing between apps and remotely wiping out data on the apps. For a complete list of supported policies, please review the Manage Yammer with Microsoft Intune support article. All of these policies are available for use on both mobile device management (MDM) enrolled devices and on unmanaged devices through Intune’s MAM without enrollment capabilities. 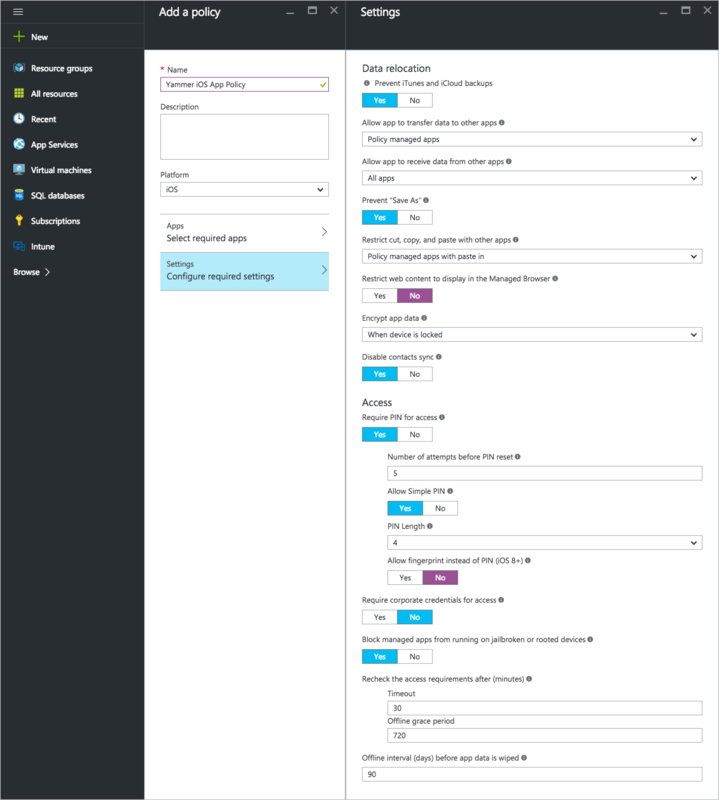 MAM without enrollment is a great option for BYOD (Bring Your Own Device) scenarios, where you want to keep corporate data safe without managing a user’s device. To enforce MAM policies, users should be authenticated to Yammer by Azure Active Directory (Azure AD) accounts through Office 365 sign-in. The updated app will be available in the Google Play and iOS App stores today.